Cleaning...it's the story of my life. At least in this stage of my life, with 5 children 9 and under. I used to get excited about spring cleaning but now that most of my days involve cleaning in some shape or form; cleaning and I are not on the best terms but by God's grace and strength we are working our relationship out! Even though I might not like cleaning up spill after spill or one mess after the other I want to be faithful as a homemaker and do my job well. I find if I have a well stocked arsenal, I am better able to fight the battle against dirt, crumbs and sticky messes that are waged daily in my home. I like using natural ingredients already in my kitchen that are only harmful to the germs and grime in their way. Here are the natural tools weapons that I always try to keep on hand that bring light to the darkness and hope in the midst of dust, smudges, grime and soap scum. *All purpose spray- I put hot water, Dr. Bronners soap( or you could use a natural dish soap), white distilled vinegar and an essential oil in a spray bottle. I clean my counter tops, windows, spills and just about anything with this spray. *All purpose floor cleaner- I use the same ingredients as the all purpose spray for my tile and laminate hardwood floors. *Wood cleaner- I pour a little bit of olive oil and Dr. Bronners soap on a damp rag to clean fans and wood surfaces. I also like Murphy's oil for my wood surfaces and floors. *Bathroom Scrub- I mix up baking soda, Dr. Bronners soap, vinegar and an essential oil. It works wonders on that dirty ring around the bathtub and the scum in the sink. *Stainless Steel Scrub- simply mix baking soda and lemon juice together and watch your sink and appliances sparkle. *Rags- I use a lot of my husbands old shirts for cleaning up various messes and for dusting. He doesn't even miss them. *Paper towels- are great for messes and spills that need to be disposed of quickly and conveniently. *Towels- I usually keep a big towel on hand in the kitchen for quick clean up of big spills. Having this handy literally keeps me from crying over spilt milk. *Sponges- great for cleaning and scrubbing stubborn grime and gook on counter tops, walls, chairs, and bathrooms and anywhere my children are. *Dr. Bronners soap- is a vegetable based soap that is gentle on the body and tough on dirt. It's uses are limitless! *White Distilled Vinegar- eliminates odors and kills germs so it's a no brainer in my cleaning list. *Essential oils- I love using essential oils for cleaning. They not only smell good but have great cleaning properties. I use tea tree oil in the kitchen and bathroom for its antiseptic and antibacterial properties. Peppermint oil also is great for its antibacterial power. I love using white grapefruit oil, orange, lemon and lavender also. I basically keep an arsenal of essential oils on hand. *Lemons- are basically the smell of clean to me. They also have so many versatile benefits. They are great disinfectants and combined with baking soda, clean just about anything. Hope this list of cleaning essentials helps you conquer the war against dirt in your home and brings some shine and freshness to your daily grind of cleaning. Mine is that it never ends!! What is your least favorite thing to clean? 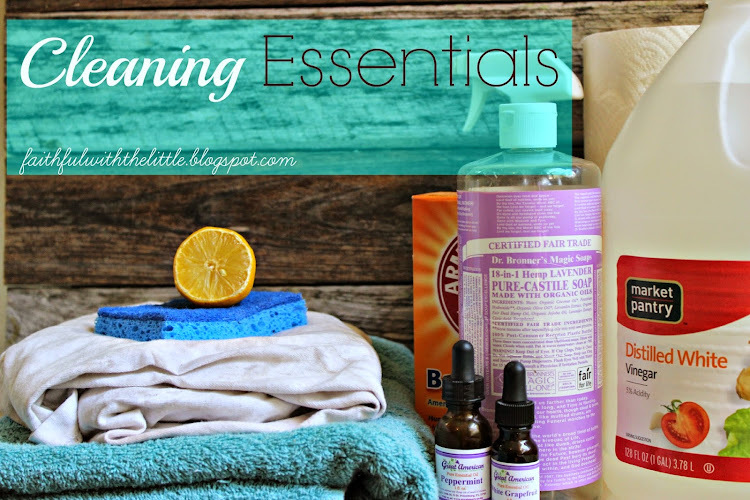 What is your go to cleaning product or tool? Mine is the lowly but versatile towel!